I’ve decided to start blogging again with the WTA tour for the Doha-Dubai double. While i’m not expecting to be posting as much as I have done in the past, I am excited to get back to writing! Bear with me as I get back into the swing of things. I won’t be doing prediction pages for now, but I will try and share my thoughts about matches on the main page. Let’s take a look at what happened on day 1 of main draw action in Doha. Saving a set point in a 66-minute opener, Dominika Cibulkova reached the second round of Doha with a 7-6(8) 6-4 win over Anastasia Pavlyuchenkova. Cibulkova maintains her excellent record over Pavlyuchenkova with this being her seventh win in ten encounters. I always remain optimistic that Pavs is going to realise her full potential but this hasn’t been an encouraging start to the year with just one match win on the WTA tour in 2018. Dominika @Cibulkova grabs the first win of @QatarTennis 2018! CiCi Bellis was a set and a break up on Daria Kasatkina when the Russian player pulled the plug, retiring hurt with a neck injury. It’s a real shame because Kasatkina had looked great in St Petersburg – when she is confident and free-flowing, Dasha’s a joy to watch. I started watching this one during my lunch break at 5-5 in the first set where Bellis conjured up a dreamy drop shot on the way to holding and then breaking for the set, with a lot of help from Kasatkina and some errant forehands. Bellis was clutch on serve in the second set and generally serving better. Rest up, Dasha. Anna Blinkova caught my attention last year when she successfully came through qualifying to reach the main draw at three of the four Slams. I was also impressed that the 19-year-old managed to beat Monica Niculescu in the first round of last year’s Australian Open. I always think that playing Niculescu is a litmus test for an up-and-comer and Blinkova passed with flying colours. Blinkova was unlucky to draw Elena Vesnina at both Wimbledon and US Open last year, winning a set in the former. For the third time in less than a year Blinkova drew Vesnina again, this time in the first round of Doha. For the first time she got the better of her fellow compatriot in a surprisingly one-sided scoreline, 6-1 6-3. This was the best win of Blinkova’s career so far – one to watch! Blinkova moves into @QatarTennis second round! Agnieszka Radwanska needed TEN match points to finally see off Mona Barthel, 3-6 6-3 7-5. This was a decent match with a dramatic conclusion. Barthel was so fluid and free on the match points, and kept finding the lines as Radwanska sat back. Radwanska managed to overturn the umpire (again!) after Marija Cicak made a mistake in the score at 4-2 in the third set. You can hear Mona say to Aga at the end that she didn’t know what the score was! It wasn’t a vintage display by any means from Radwanska and she had to work very hard at the end. Still, she was mostly consistent and maintains her 100% record in three set matches in 2018. In fact, this was the third time this year that she’s come from a set down to win. For Barthel, I was pretty encouraged by the performance considering her recent run of form.
.@ARadwanska slides into @QatarTennis second round! In a battle of the best hair on tour, Naomi Osaka won the last eight games of the last match of the day to beat Katerina Siniakova, 6-4 6-0. Through the first eight games, Siniakova was arguably the better player but couldn’t take advantage of her opportunities. Osaka was brilliant in the second set, forceful and contained, as she overwhelmed an increasingly frustrated, Siniakova. Osaka had the trainer on for her back during the first set. The Japanese player said it got better in her post-match interview and she has a workable draw going forward in Doha. Osaka and Siniakova didn’t get onto court until after 11pm local time. Not a surprise at all when there were six matches scheduled for Centre Court with a 12pm start. It’s completely ludicrous as the second court had only two matches scheduled for the day! Selifshly it’s nice for me to get to watch more live tennis, but I do feel for the players. Forcing them to play this late is just so unnecessary. And finally a heads up that you can catch up on all my Australia travels on the blog at the link below. 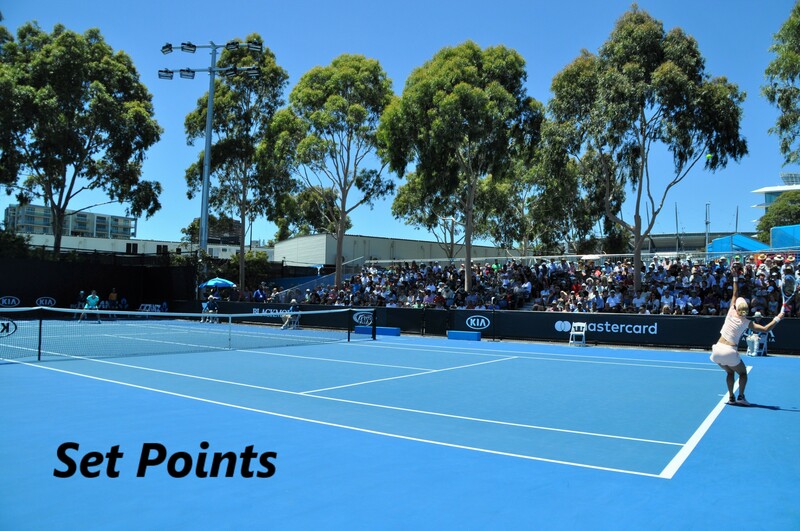 I’ve written about the three tournaments I attended including a comprehensive guide to visiting the AO. If you’ve got any questions about attending the tournaments in question in the future i’d be more than happy to help. I really enjoyed writing about the trip and i’m happy to have finished and can put the trip behind me. I promise I won’t mention Australia again 😂. yay for the set points 😀 I wasn’t convinced by Radwanska at all. She was really passive during most of the match points and only got lucky with a very lucky netcord to get a 10th match point. However, when breaking for 6*:5 she did it with two amazing points. It’s like hot and cold right now and I’m curious whether she’ll be able to get herself back to the top. 😄 I wasn’t sure what to make of Radwanska. She seemed to be working so hard at the end and did get passive on the MPs. At the start I thought Barthel had a good shot of winning if she played to a consistent level. Radwanska definitely improved in sets 2 and 3 and seemed more aggressive up till serving out the match.